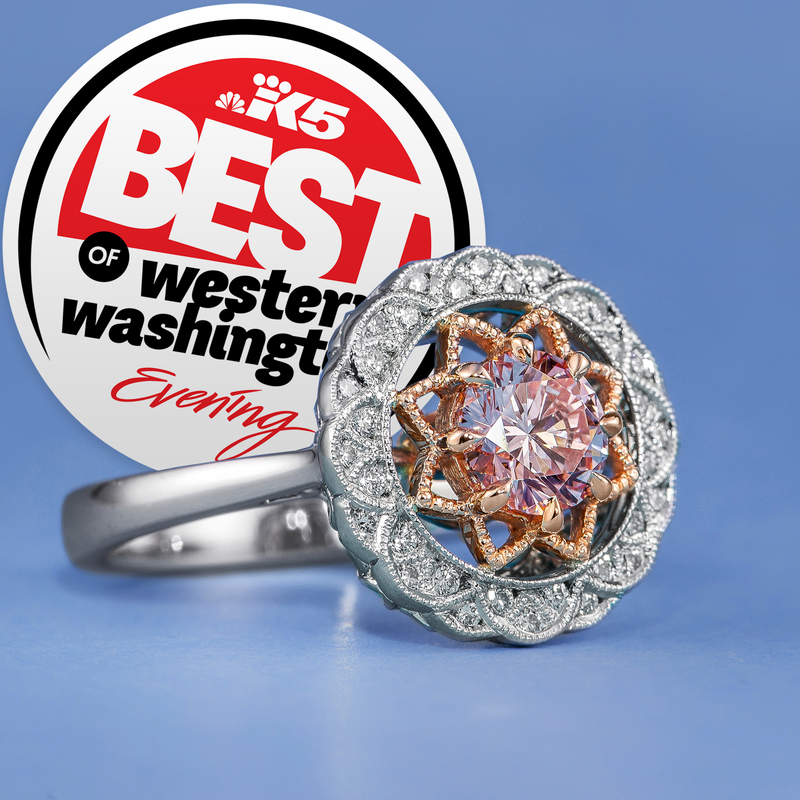 This year Green Lake was lucky enough to win both awards in jewelry from Evening Magazine’s annual Best of Western Washington contest, Best Jewelry Designer and Best Wedding Rings. Voted on by thousands across the region, this people’s contest recognizes the very best goods and services our area has to offer – and we’re humbled to be on that list once again. There’s a lot of ways a small business can win this distinction, but we think it’s best to simply focus on matchless customer experience every day, all year long. At least that’s the common thread we see in our neighbors who also won – from an extensive organization like Nordstrom to a flourishing icon like Theo Chocolate – each are regarded as an experience unto themselves. These are businesses that seek to wow visitors and employ experts in their craft to make available the kind of purchases found nowhere else. It takes a lot of work to deliver this experience – and while so many of the businesses nominated this year do the very same – it takes time to see your reputation grow. So while all the email blasts, social media posts and efforts to cajole votes from customers may have helped to win, it’s likely our 20-year-old reputation for superior experience that synched us the win for both categories in jewelry. The Green Lake experience, that is wowing our clients, is really the product of a lot of “little wows.” Offering custom made rings is only exceptional if there are professional designers to work with, an ethical supply chain to discover, award-winning metalsmithing to watch or a lifetime guarantee to trust. Artistry is the cornerstone of our business, so it can’t just live within sparkling display cases; artistry at Green Lake is in the murals on the floors, in the photography on our site and even in tightly poured rosettes atop the lattes we serve. These are all just little wows, but they eventually add up. Being descent helps too. Like any business, Green Lake is here to make a profit, but guaranteeing satisfaction on our work is absolutely paramount. When we make it OK to always act in the best interest of our clients, it assures us a community at large who speaks well of our company with their friends – and votes for us in the Best of Western Washington. Knock on wood, it’s worked thus far. We’re not taking victory lap per se but we do think it’s important to reflect on how we win awards like this (e.g., Best of Western Washington for Wedding Rings and Designer Jewelry, Seattle Bride for Best Wedding Rings and Designer Jewelry, The Knot for Best Local Weddings, American Express Member Favorite or “The Coolest Store in America” from INSTORE Magazine). While we didn’t set out to win recognition, we are quite purposeful in offering a wedding ring experience our clients will appreciate for life. Now it’s our clients – and their friends and family – who we appreciate more than ever. THANK YOU for voting Green Lake number one, once again. A note about winning businesses in Tacoma: A third of all winning restaurants and half of all winning wedding vendors in the Best of Western Washington this year are in Tacoma (so if you haven’t done so recently, visit Tacoma). Bravo!